Every year in the Tyrol, some 180,000 cows, horses, sheep and goats spend their summer in the mountains, grazing on Alpine pastures new. In September the cows return home, an occasion that is celebrated by decorating the cows with flowers, garlands and bells for their safe return home for the winter months. With a party atmosphere, there is music and dancing in the villages for this momentous occasion, and we will join the celebrations on this tour! This year we have included a Wildschönau Summer card for everyone which enables us to travel on 3 cable cars, visit a silver mine and a farming museum. We are also including a guided tour of Innsbruck. Sunday  Our luxury coach will depart this morning, and head to Folkstone where we will catch the Eurotunnel Train to Calais, from there we make our way to Germany for our overnight stop and our evening meal. Comfort stops on route. Monday  We leave Germany and continue our journey to Austria. Enjoy the changing landscapes as we arrive in Auffach in plenty of time to settle in before dinner. 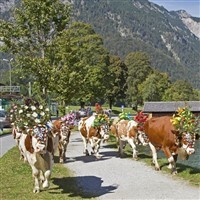 Saturday  The highlight of the tour as we travel to Soll for the fabulous Cows down festival. Throughout the day the village is a hive of activity and celebration as each herd is brought down the mountain into the village, all beautifully decorated as we all honour this happy occasion. We will spend the whole day here to enjoy the festivities. Sunday  Sadly we say goodbye to Austria and being our journey home. Retracing our steps, we head to Germany for our overnight hotel in time for dinner. Comfort stops on-route. Monday  We leave Germany and make our way back up to Calais and our Eurotunnel crossing, once back in the UK, we head to Wiltshire and our taxis which will be waiting to return you safely back home after our memorable holiday in Austria. Surrounded by the impressive mountain scenery of the Kitzbühel alps, this hotel offers a quiet location in the centre of Auffach, a village in the Wildschönau Valley. All bedrooms are en-suite with TV and WiFi throughout the hotel. The hotel also has a wellness area with sauna, steam bath and infrared cabin.